The protagonist of Final Fantasy XIII-2 will be able to don an Assassin's garb in an upcoming DLC pack. Square Enix loves bizarre crossovers. At this point, the internet will probably roll its collective eyes and go "duh," but honestly, who would have thought that a Final Fantasy/Disney mash-up would become a media darling prior to 2002? Thanks to Ubisoft, another unlikely character will be entering Square Enix's world of crystals, moogles, and chocobos: Ezio Auditore da Firenze, recurring protagonist of the Assassin's Creed series. A DLC package for the upcoming Final Fantasy XIII-2 will allow new protagonist Noel Kreiss to don the iconic Italian's robes. The reasoning behind this unusual pairing is not clear. 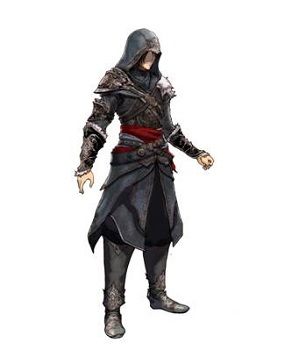 A press release from Square Enix extols the histories, fans, and sales of both series, and reveals that Ubisoft is "lending" Ezio's black Assassin robe to the popular fantasy RPG series. Aside from both series embracing yearly releases, it's hard to find points of commonality between teenagers who save the world through friendship and impossible hairdos and an aging Assassin who roams Europe rooting out systemic corruption. Nevertheless, the outfit looks cool no matter who's wearing it, although Square Enix has not revealed whether it will affect anything other than Noel's aesthetics. This promotion could be a once-in-a-lifetime collaboration between two radically different companies, but if it sells, perhaps Ubisoft and Square Enix will be willing to take on future projects together. I don't know about you, but I'm personally ready to pre-order Kingdom Hearts 3 right now if Square Enix can promise me a level that features Sora leaping into haystacks and lobbing Italian profanities at Templars.